Now they share a bedroom. 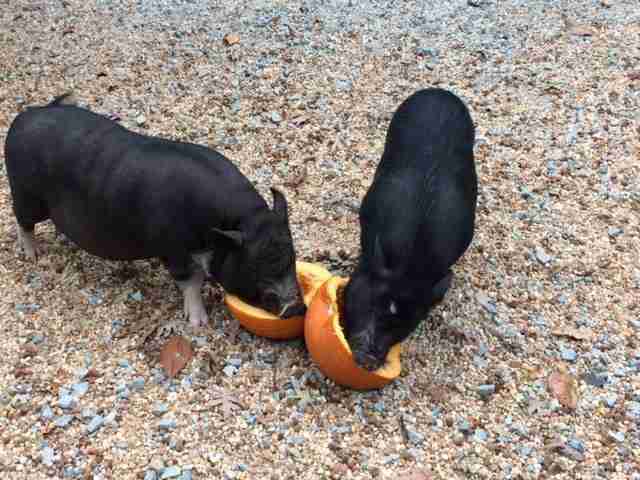 In August 2016, animal control picked up two stray potbellied pigs. They were skinny, malnourished and had horribly dry skin. One of the pigs even had deep scars around his neck, perhaps from a dog attack. 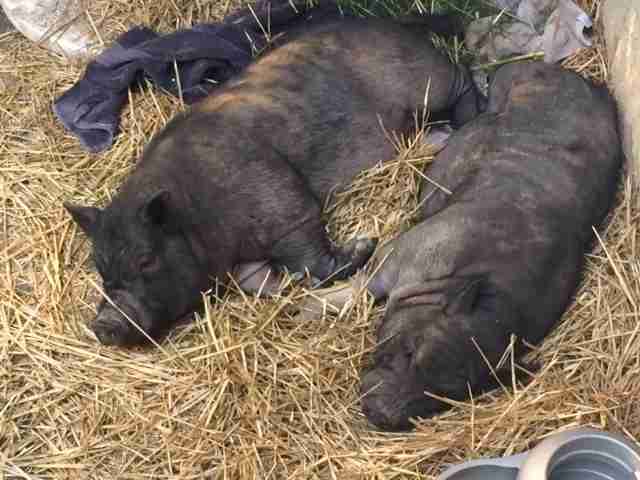 After spending a few weeks at a North Carolina animal shelter, the pigs were put up for auction. The shelter was at full capacity, and it wanted to get rid of the pigs as soon as possible. On the day of the auction, no one bid on the pigs. 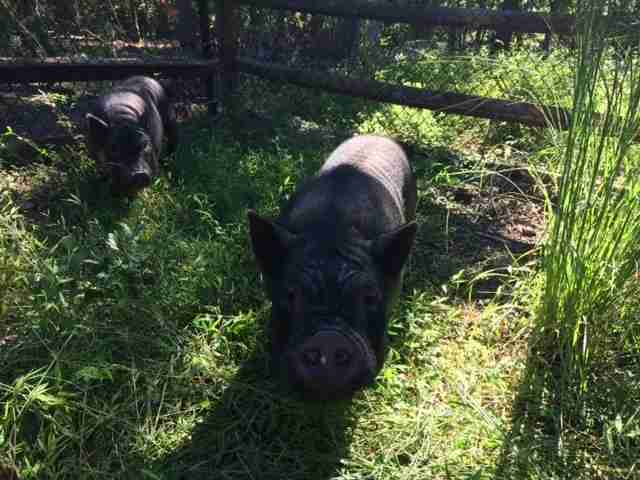 A woman from a rescue group called Saving Grace was at the shelter that day when she noticed the pigs. She contacted Alesja and Alex Daehnrich, a German couple that runs Blind Spot Animal Sanctuary, a small rescue farm in Durham, North Carolina. 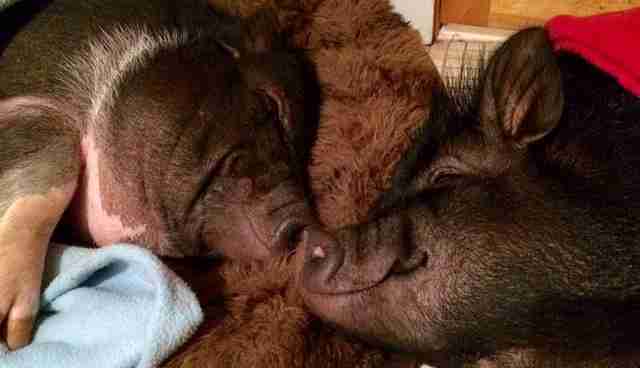 Could they foster these two pigs? The woman asked. Alesja and Alex couldn't say no. "I actually had no idea I was going to pick up pigs that day," Alesja Daehnrich tells The Dodo. 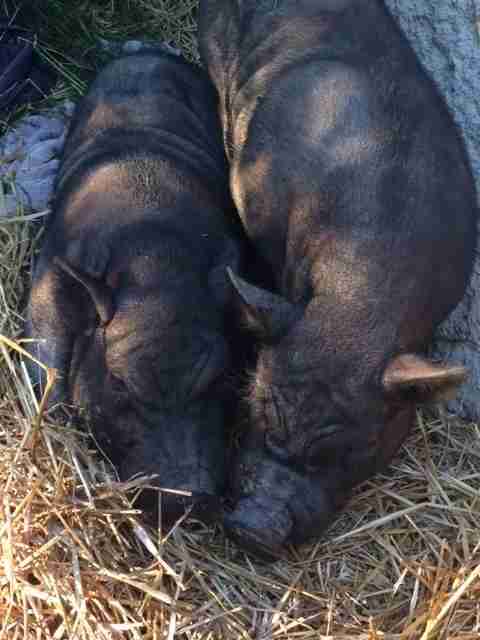 "I was at work all dressed up wearing high heels when I got a call in the morning about two pigs needing a foster home. I drove to get them after work, my coworkers gave me towels to place in the car and the rescue had crates for me." The pigs turned out to be brothers, and they were as close as brothers could be. "They ate, slept and rooted together," Alesja says. Rooting is a natural pig behavior that involves searching the soil for food. They named the brothers Piggeldy and Frederick after a German pig cartoon. Frederick was the braver of the two - he was happy for Alesja and Alex to touch him and hand-feed him treats. Piggeldy, on the other hand, didn't want anything to do with his foster parents. Then the unexpected happened. When Alesja and Alex took the pigs to the vet for vaccinations and neutering, the vet discovered a large tumor around Frederick's bladder. "The tumor was so big that it was inoperable and the veterinarian felt it was only humane to let him cross over the rainbow bridge," Alesja says. "We all were crushed, and most importantly, worried about Piggeldy, as he was the insecure one who depended on Frederick." Piggeldy was lost without his brother, and he went through a period of deep mourning. "When Piggeldy came home, he searched for Frederick everywhere and when he realized he wasn't coming back, he was mourning the loss of his brother," Alesja says. 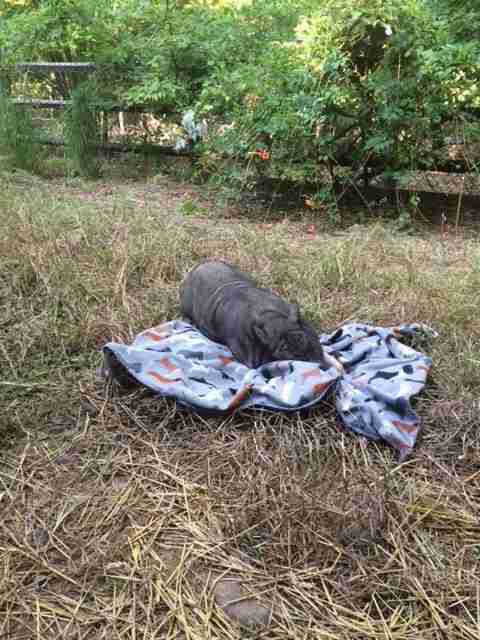 "He wasn't moving much and just laid in the middle of the yard, staring. While he ate breakfast and dinner, he didn't show any excitement. It was heartbreaking to see him so sad." Alesja and Alex did everything they could to cheer Piggeldy up. "We tried to work from home when possible, and I even sat in hay with him with my laptop doing work," Alesja says. 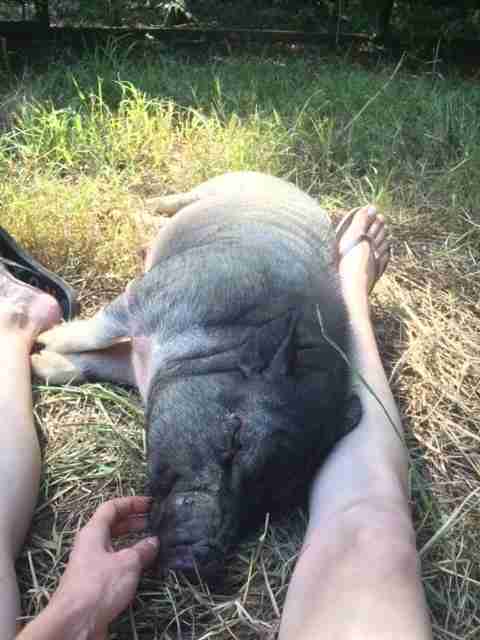 "I laid in hay with him for hours, just rubbing his belly and massaging him. It seemed to comfort him when I talked to him, as he always responded with a grunt." After about a week, Piggeldy perked up. He started trotting up to Alesja and Alex for belly rubs and squealing with excitement when he saw them. 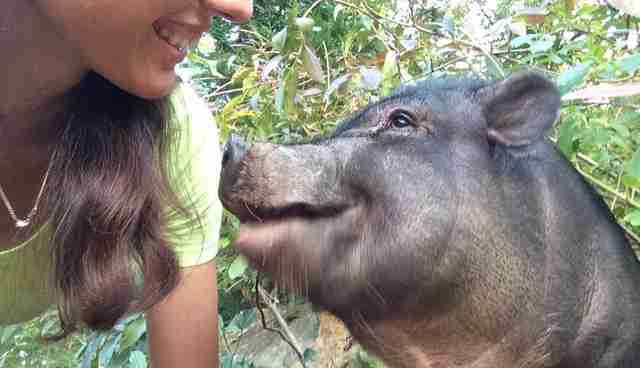 They soon realized that Piggeldy didn't need to find another home - he was already home. 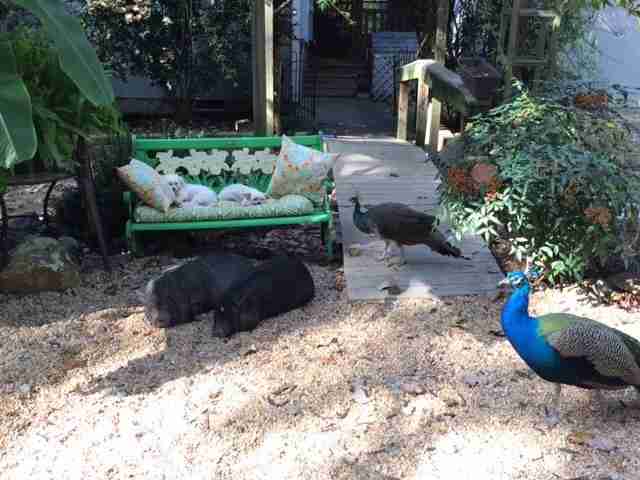 They also decided it was time to introduce Piggeldy to the rest of the animals, which included dogs, chickens, ducks, peacocks, horses, mules and another potbellied pig named Kevin. The thing about Kevin, according to Alesja, was that he's a bit of a "diva." 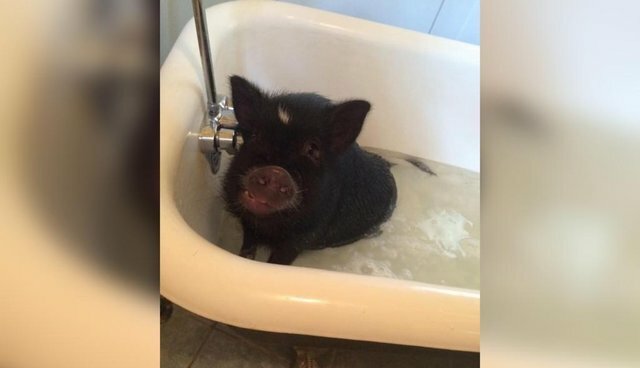 He'd arrived at the sanctuary as a piglet after his original family decided he was "too much" for them. And he was spoiled - very spoiled. "Kevin grew up in the house as an only pig, sleeping on the couch, getting anything he wants and trying to rule the farm," Alesja says. "He would protest if he didn't get something he wanted and would occupy himself by opening drawers in the kitchen, raiding the pantry or getting into horse feed in the garage." Kevin's diva status didn't seem to bother Piggeldy one bit. 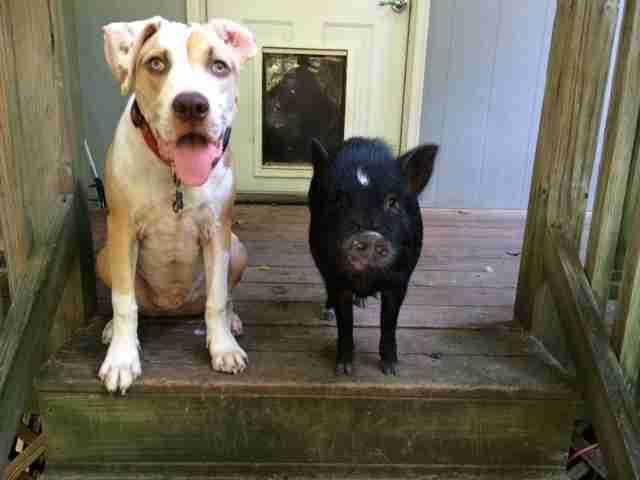 As soon they met through the fence, Piggeldy knew he wanted to be friends with Kevin. "It didn't take long for Piggeldy to follow Kevin inside the house through the doggy door," Alesja says. "He checked stuff out and the next day he followed him again, only this time, he never left. All of a sudden, Piggeldy disappeared and when we went to look for him, he just tucked himself in in Kevin's bed and fell asleep. 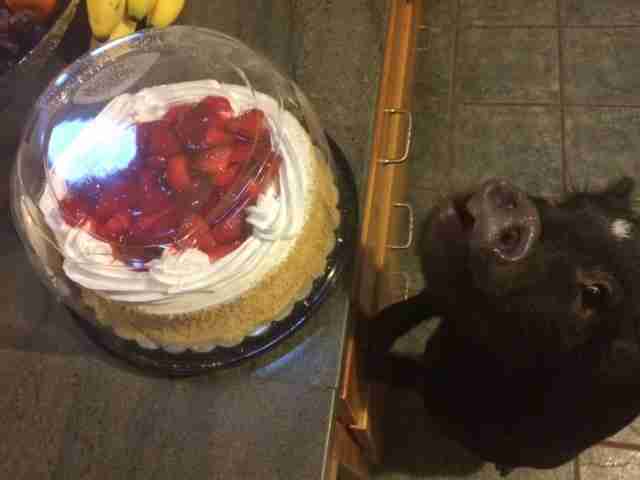 Starting this day he became an inside pig along with Kevin. They share a room together where they sleep." 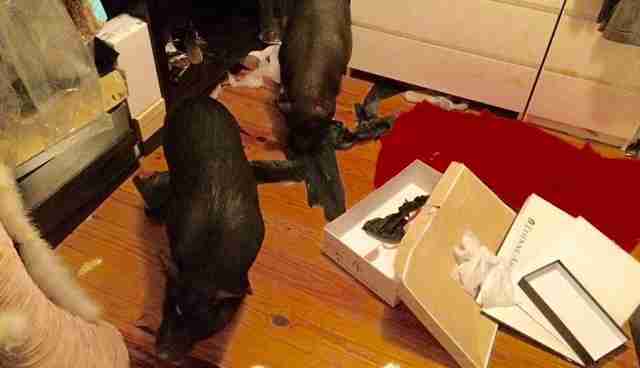 The pigs also love to make a mess of Alesja's closet. "I jokingly say that they play dress up," she says. "Piggeldy often falls asleep on a pile of shoe boxes. They never touch the shoes, they just love playing with the boxes and paper. Somehow they do not touch my husband's stuff - only mine. They know they aren't supposed to as when I come in and say, 'what did you guys do?' they make these high-pitch squealing noises as if they say, 'We know, we are in trouble.'" While Kevin taught Piggeldy about being an indoor pig, Piggeldy taught Kevin about the outdoors. 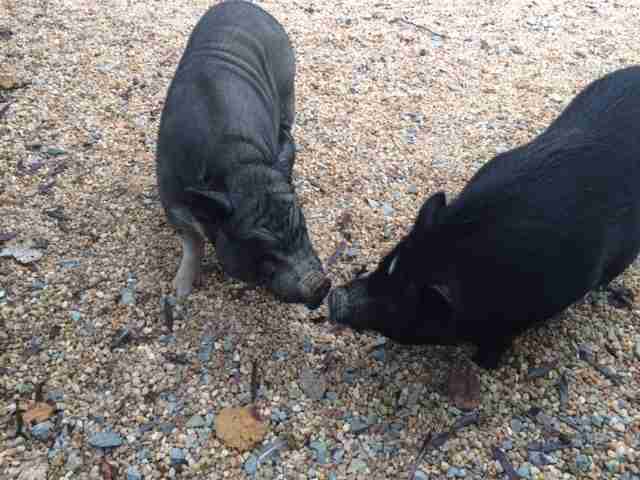 "After a while we noticed that Kevin was out and about doing what pigs do," Alesja says. "Piggeldy somehow was able to correct his behavior by communicating with him. Somehow they found this common language and what seemed impossible before became the norm." 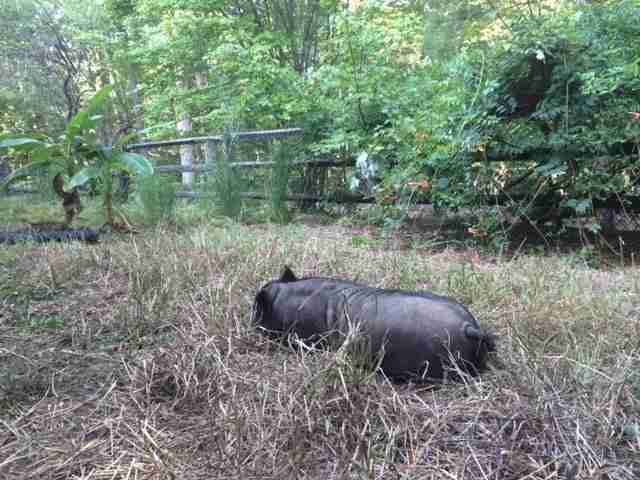 Soon Kevin and Piggeldy were outside together all the time, snacking on acorns and using trees as scratching posts. "Before Piggeldy joined our family, Kevin never wanted to share; he would not want to share the couch or pool with a dog," Alesja says. 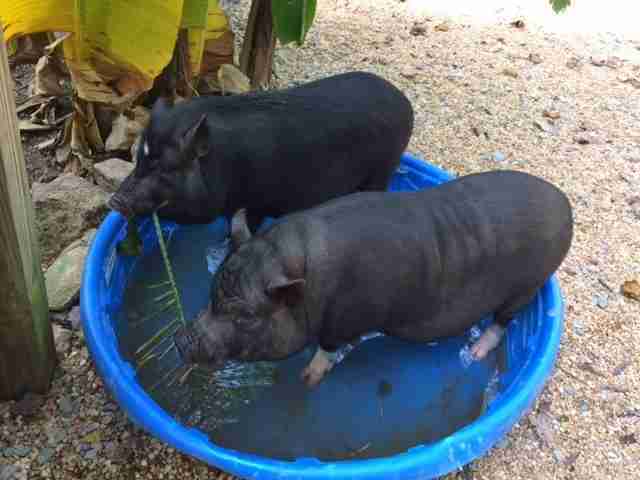 "But with Piggeldy, they now share the pool. It took Kevin a while to learn, but we now see them together all the time. They snooze together in the middle of the day." "We love them both so much!" Alesja says. 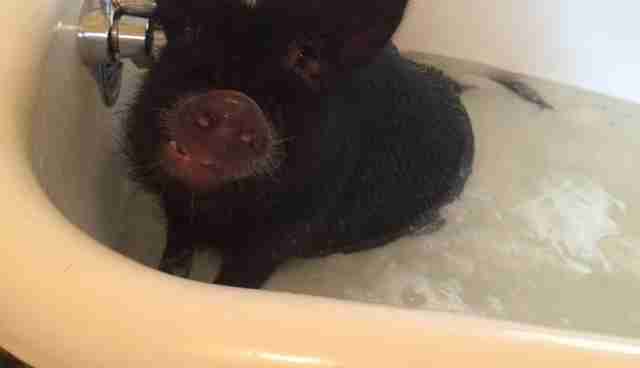 "We've never had pigs before and when we adopted Kevin, it was quite an eye opening experience. We love all of our animals, but these two have a very special place in our hearts and we have a special kind of bond with them." To help pigs like Piggeldy and Kevin, you can support Blind Spot Animal Sanctuary by making a donation here.